looks like it can do allot more than just images. Hey guys heres a cool metaball tutorial by daniel shiffman who also has other cool tutorials relevant to demoscene coding. in written tutorials when they throw to much math at you with not enough explanation behind it. well you can leave out perspective projection all and just plot the X and Y of a 3d point for orthogonal projection. or you can just divide the X and Y by the Z component for perspective projection. its that easy. It will give a 90 degree field of view. as for transformation matrices i reccomend your try it out in 2D first, try kahn acadamy videos on the subject. Freebasic / Re: DIY possible? I think your artificially limiting your self, making the process of learning harder for you. If you have a modern Mac machine i would look into the processing programming language environment to begin learning. Its basicly java which is a C style language. The programs you write will work on the big 3. Apple, windows and linux. so when you upgrade your old computer all your programs will just work with 0 changes. After you learn the basics with that then i think you can go back and do the harder stuff. Coding fast stutter free routines for older hardware is harder than on a modern machine. and requires lots of difficult to understand tricks that beginner programmers can sometime find hard and give up before they produce anything. personally i recommend you update your dev machine. and leave your decade+ old machine for running legacy applications/demos ect. That way you can use modern dev tools like everyone else and run code they give you to help you along. that should make learning easier for you. having said that, your old machine should still be fine to code with. just focus on the basics first. like ploting a pixel, then line drawing algorithm ect. I heard about processing which can do python and Java plus there more to come(I think it can do opengl too). It more of graphics programming which can be good things. perhaps for more advanced stuff like shaders, shadertoy would be a better option however. Im just not sure if its a good idea to post tutorials in the forum or to submit a tutorial to the admins so they can put it in dedicated webpage where youtube videos or a processing program can be embedded into the page. as im not sure thats possible in a forum post. but yeah there will always be one post wonders who come and go. That can't really be avoided. But im sure the people that show enough interest will stick around. I dont know i think people are just busy with life and all that stuff . To make things more active i think people should put forward some simple tutorials. Wouldn’t it be good if we all started to create a resource that catalogues all the classic demo effects. from scrollers, to star fields and tunnels to twisters. Information on some effects i find lacking on the web, for example classic the lens effect. If we build up a database of effects DBF could be a resource that lots of people will follow. I think we should put a heavy emphasis on newbies and not assume everyone is a maths genius. Due to the variety of languages i think we should stick to pseudo code. or pick one common language to code examples in. My vote would be for processing. Its C style, modern. and dose away with all boilerplate code, and works on all 3 major platforms. I'm happy to contribute effects that I know, in the tutorials section. we could think about setting up a Github containing the finished products. Having once resource will help more people join and that means more people to contribute more effects and techniques that others in DBF can benefit from. Having people like hellfire here is a real win as he seems to know allot. 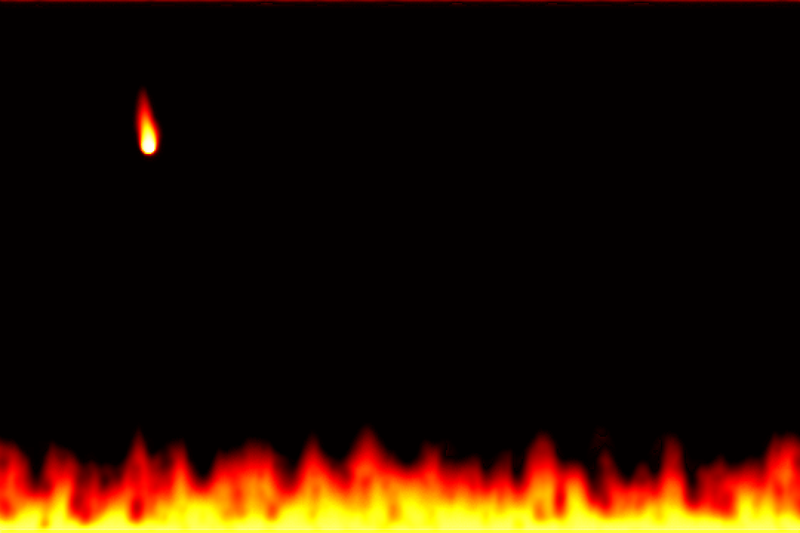 I implemented the HugoElias tutorial and came away with some really cool looking fire ! its the cooling map addition that really makes this effect look good. it's retroish, it sounds good, it looks good... win-win for me! soooooooo many effects in a single prod make me cry as I can't code a single rotating cube or even a rotozoomer!! i figured how to do a rotozoomer just a week or so ago, there not to difficult. I may do a tutorial once i have some spare time. damn if only i had more time !! i have to go to my stupid job ! You can use any platform that is compatible with windows XP, Vista, Win7 or Win8. horrible, no love for linux. what a shame. To get you started, its much easier to just do a simple left to right swipe transition. Here is a simple example in processing that starts off with an all black alpha channel. Every 10ms it draws a 1px column to all white starting at the left of the alpha channel untill in reaches the end, by which time the all black alpha channel is now all white. you can do all sorts of fancy transitions this way. even using gray values to act as an transparency value. here's a screen hot of my simple program, transitioning from a red image to a blue image. My take would be to load at least 2 screens that you want to transition between in memory. and then perhaps use a 3rd image as an alpha channel. and animate the alpha channel so that every pixel that is white show image #1 and every pixel that is black show image #2.
all you need to do then is animate the alpha channel to provide the clockwork like transition between the two images. as for implementing that you could start start of with the alpha channel all black. and then starting from the center of the screen draw 2 lines. One from the center, straight to the top and the other to move to the left or right by 1 increment such as 1 degree. then you simply flood fill between the 2 lines to be white, which will show the whole of the 2nd image once complete. there are probably better ways to do it. but that should be a good starting point.